When work’s a (physical, literal) pain, a look at how you move your body at the office is well overdue. 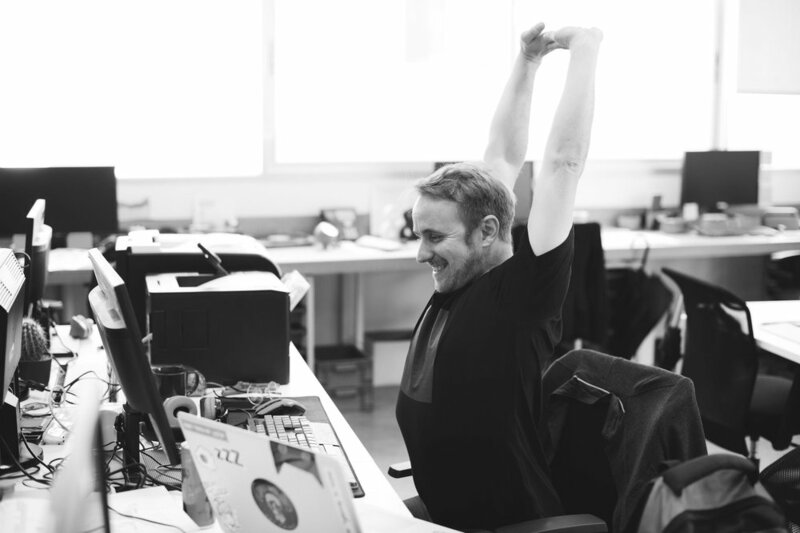 We’ve covered the impact of sitting, but there’s more you can do to keep your body healthy and limber at work. Bottleneck Neck: During your commute to work (not while driving, please! ), practice some neck rolls, suggests Darrin Zeer in his book Office Yoga: Simple Stretches for Busy People. Drop your head to one side, rolling it around in a circle in one way then the other. When you come across a particularly tense spot, pause and take a few breaths. Combat “Tech Neck”: Our devices and computers are not necessarily designed with our health in mind. How many hours a day do you spend looking down at your phone? Yoga Journal suggests a front chest opener: Facing a wall, put your right elbow and forearm against it a little above shoulder level (think “cactus arms”, putting your arms out like football goalposts, but a little higher). Switch sides. Breathe in Good Energy, Release the Bad: You can even use this one in a meeting without anyone noticing. (They may notice your more positive vibes though!) Send oxygen to your brain by taking a few cycles of deep inhales and exhales. Breathe in what you think you need (a boost of energy, calm, etc. ), and when you breathe out, visualize letting go of stress and tension. Do the Twist: One of Zeer’s “Hang in There” stretches, this one is great towards the afternoon or end of the day after a long meeting. In your chair, cross one leg over the other and put the opposite hand or elbow on your crossed knee. Twist towards the leg on top and hold for a few breaths. Switch legs and repeat on the other side.